We at GOM are a service-based business that assists customers like you in finding the most suitable office equipment for your needs. Rather than being a sales-based business that sells according to the KPI and targets of the manufacturers, we care more about bridging the gap between the buyers and the products. Of course, we are technicians first and foremost. For the past 20 years, we have been recognised as industry leaders when it comes to onsite printer repairs and services. Since we focus on these kinds of solutions, we know which machines can really help boost company efficiency and productivity. At the same time, we know how to make your equipment work better and last a lot longer based on how you will be using them. 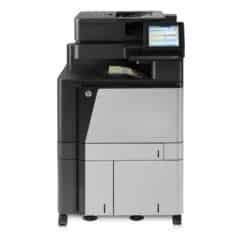 even an HP Gold Business Partner, so you are sure to find makes and models to suit your taste and budget. As required, we also offer free loan machines in the event that you bring your current product to us for repairs and it needs some time to be fixed. Any parts that are replaced for the repair come with a 3-month warranty. Hence, you don’t need to worry if another hiccup pops up during that time period. We will quickly and easily look into it with minimal questions asked, though a second fix is highly unlikely given our 98% first visit success rate. All of the people on our team are dedicated to helping you match the right machine for the right application. Whether it’s a small desktop printer or photocopier up to large-format professional printers, we know what will suit you and your needs. It doesn’t matter if you are an SME or a government organisation, we believe the perfect product for you is out there and we’re here to help you find it. Even after you have made your purchase of office equipment, our friendly staff members will continue to serve you with the highest level of customer care in mind. We understand how frustrating it can be to be faced with a malfunctioning photocopier or printer so our experienced and skilled technicians are always ready to respond to your need for fast and affordable onsite services.